Before colonel Gaddafi seized power in 1969 Libya was a federation consisting of three parts: Tripolitania, Fezzan and Cyrenaica. 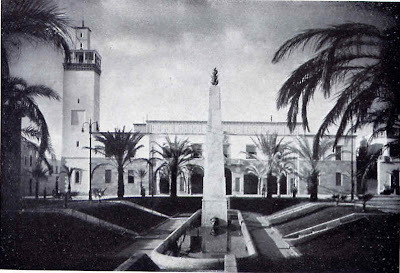 The cities of Tripoli and Benghazi served alternately as the national capital (Fezzan being a dessert, tribal area, didn't provide a capital). Cyrenaica, the region around Benghazi, was originally colonized by the Greeks. It is named after the ancient city of Cyrene, one of the greatest intellectual and artistic centers of the Greek world, famous for its medical school, learned academies, and architecture. From 1879 on Tripolitania and Cyrenaica were two separate Ottoman provinces (vilayets). 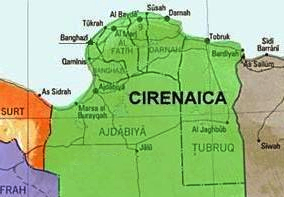 In 1911 the Italians invaded, and a colonial war developed during which from 1920 until 1929 Cyrenaica was a semi-independent emirate led by sheikh Idris. When the Italians had finally won they (i.e. Mussolini) combined Tripolitania, Cyrenaica, and Fezzan into the Italian colony of Libya in 1934. 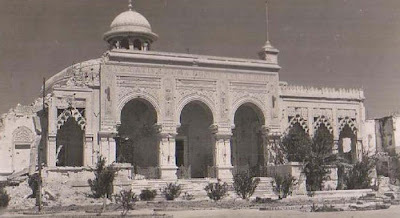 From 1942 until 1949 Cyrenaica was occupied and administered by the English. From March 1949 until December 1951 the Emirate of Cyrenaica was an independent state led by Emir Idris. Its independence was recognized by the UK. In 1951, forced by the UN, the kingdom of Libya was formed out of the three parts, led by (now) king Idris. What we see happening today sometimes seems more like a war between the two main components of Libya, each with their own distinct history, instead of a rebellion against a dictator. Rob, I'm very much enjoying learning more about Libyan history. I knew some of the Barbary War info, but I haven't really taken a look at the historical geography of Libya. I noticed that we're headed towards another actress. Will we get a history of Fezzan later? I hope. 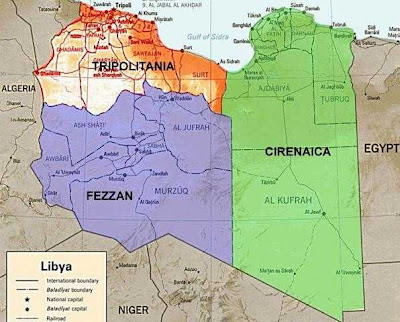 I focussed on Cyrenaica since what we see happening today sometimes looks more like a war between the two main components of Libya (each with their own distinct history), instead of a rebellion against a dictator. As soon as Fezzan gets in the news I'll make a post about them! Can you please give me the sources of the map of Tripolitanian Republic and the Emirate of Cyrenaica. I made the maps myself, it's a hobby of mine (I wish I had more time and the proper gear). so how you know the borders of states is right? specially the south border of Cyrenaica ? Hello Rob.. I really like what u did and i'm a Libyan citizen and from Cyrenaica too :( , and i want add some points like, the southern borders are with Sudan and Chad, and u can add Kofra city with this region too, and it was the 8th arabic country got it's dependence from the UK and the Tripolitanian Republic asked the king Idres to join his state in order to get the independence too and it happened. Thank you! I adjusted the maps. I hope everything will work out for you and your country.